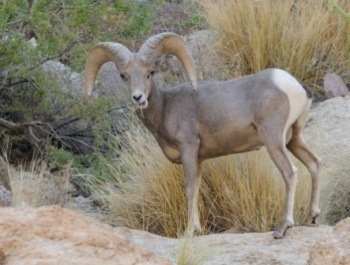 Wildlife enthusiasts can join the Arizona Game and Fish Department on two Canyon Lake boat tours this weekend to view desert bighorn sheep. The department is hosting a three-hour tour the morning of Saturday, June 27, and another one on Sunday, June 28. Both tours will leave the Palo Verde boat-launch area at 7 a.m. The tours cost $50 per person and are limited to 22 people each. You'll also need a $6 Tonto Day Pass to park at the Acadia Recreation Area before the tour. Game and Fish says in a news release that June and July are the best time to spot bighorns, since they stay close to the water during those months. It's also the bighorns' mating season, so you might see rams fighting or chasing ewes. In addition to the iconic bighorns, participants might also spot bald eagles and other water birds. Deer, mountain lions, javelinas and smaller mammals live in the area, the department says. To register, call Game and Fish's Joe Yarchin at 623-236-7589 during normal business hours.